Mathrubumi Thozhilvartha 26th July 2014 issue is now in stands. To read the latest issue of Mathrubumi Thozhilvartha dated 26 July 2014 (published on 21 July), buy a copy from your local book vendor. Thozhilvartha published by Mathrubumi is one of the leading employment weekly featuring updated news on rising opportunities in public and private sectors. 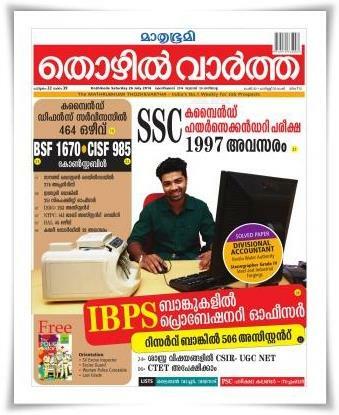 Mathrubumi Thozhilvartha, the leading weekly for job prospects in Kerala has published its 26th July 2014 issue. As done in its previous editions, more importance is given to the Kerala PSC notifications, solved paper and exam preparations. The highlights of the current issue are the latest PSC notifications, special orientation on SI/Excise Inspector, Excise Guard, Women Police Constable, Last Grade examinations, solved paper of Divisional Accountant, rank list of Tribal watcher Wayanad and PSC Exam Calendar-September 2014. This would give an insight to the candidates who are preparing for the upcoming exam. While going through the pages, details about vacancies reported from various organizations are given with prominence. 464 opening in Combined Defense Service, CISF(985), BSF(1670), 506 assistants in Reserve Bank, 251 officer vacancies in Indian Bank, 143 opening in NTPC, 233 in ISRO are also reported. The SSC combined higher secondary exam, IBPS notification 2015 for 21 banks have also opened doors for those who are seeking jobs. Solved paper of the Kerala PSC Division Accountant and PSC rank list of Tribal watcher (Forest) has also been published for reference. Special coaching for the upcoming Last Grade and various Police exams are given due priority in this issue. As these exams are scheduled to take place during the months of August, September and October, candidates who are under preparation could get the maximum benefit out of it. The Kerala PSC September exam calendar is also featured in 26th July edition. A free booklet 'Harisree' with updated information on the latest general knowledge will serve as a companion for the young job seekers to update news events. As special focus is given to GK in all the PSC exams, candidates should keep their brain vigilant to gather information. With just a week remaining for the Police exams, applicants need to follow the current edition of 'Thozhilvartha'. As more than 5 lakh candidates have applied for various police posts which include Sub Inspector of Police, Excise Inspector and Women Excise Guard/Women Police Constable, it is expected that the next issue of 'Thozhilvartha' would be exclusively dedicated to serve their need. Having a circulation of more than 1 lakh copies, 'Thozhilveedhi' is one of the most popular employment newspaper in Kerala. So can you leave the current issue of this flamboyant employment newspaper? Grab 26th July 2014 issue of 'Thozhilveedhi' from your nearest book vendor and grab your dream job. Mathrurbhumi Thozhilvartha 2014 June 14 issue has been published and is now in stands. The highlight of the current issue would be the latest notifications by Kerala PSC which includes Sub Inspector of Police – General Executive Branch, S.I. Excise Inspector and others. Special focus is given to HSA,VEO, Last Grade exams while the Thrissur Solved Paper is also added. Read more to know about Thozhilvartha 2014 June 14 issue. Mathrubhumi Thozhilvartha is the most popular employment newspaper in malayalam language which is widely read by the malayali population. The major highlight of this weekly news publication would be the updated information about the arising opportunities in Government, public and private sectors. With a circulation of more than 1 lakh, this employment newspaper is the best choice of job seekers in Kerala. Mathrubumi Thozhilvartha 2014 June 21 issue is now in stands. The highlight of this issue would be the latest PSC notifications and PSC Exam Calender-August 2014. Special orientation is given to upcoming exams like HSA, VEO, Last Grade and UGC NET. Read more to know about Thozhilvartha 2014 June 21 issue. Mathrubumi Thozhilvartha 28th June 2014 issue is now in stands. To read the latest issue of Mathrubumi Thozhilvartha dated 28 June 2014, buy a copy from your local book vendor. Thozhilvartha published by Mathrubumi is one of the leading employment weekly featuring updated news on rising opportunities in public and private sectors. Mathrubumi Thozhilvartha 5th July 2014 issue is now in stands. To read the latest issue of Mathrubumi Thozhilvartha dated 5 July 2014(published on 1 July), buy a copy from your local book vendor. Thozhilvartha published by Mathrubumi is one of the leading employment weekly featuring updated news on rising opportunities in public and private sectors.